If you're a tech freak, well, here's what up with the latest trend in technology. Introducing the latest vivo smart phone, the new vivo X5Pro! Thanks to Vivo for having me at the launch which i managed to witness on the vivo X5Pro which was claimed to be inspired by the 'Touch by Beauty'. 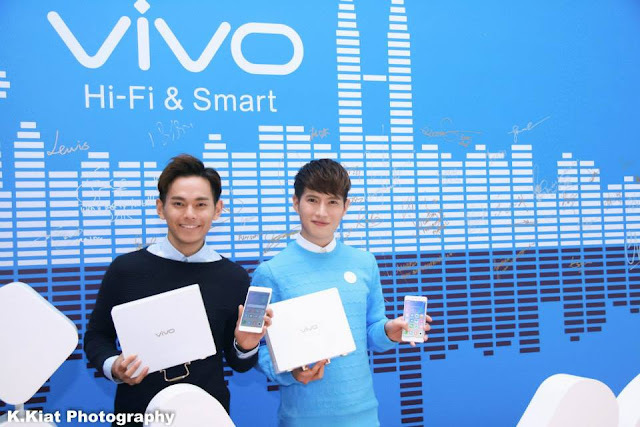 With over 1500 people at the event, including celebrities such as Amber Chia, Adam Carruthers and other celebrities who even flew all the way just to attend the launch. I think it pretty much sums up that the launch was absolutely grand as it can be. Not to also mention, that i was held at the KL Convention Centre, in the heart of Kuala Lumpur. Before i proceed any further, Vivo Electronics Corps. 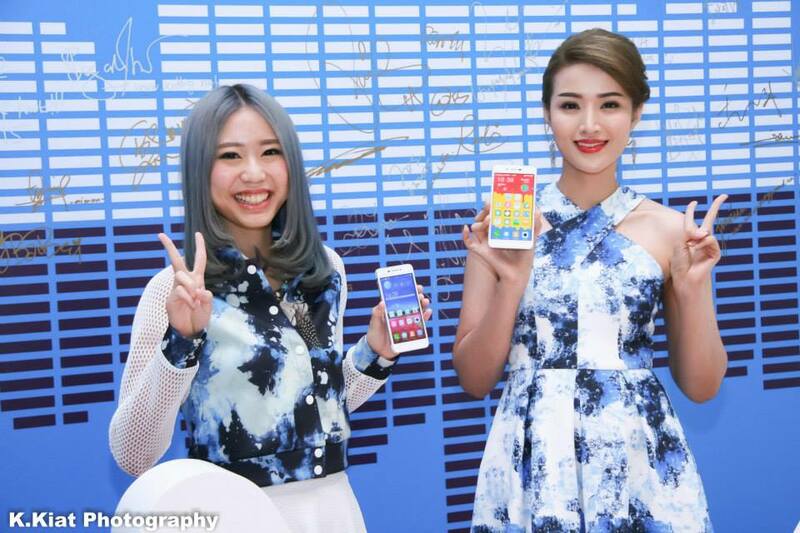 is a phone brand based in Dongguan, Guangdong, China. 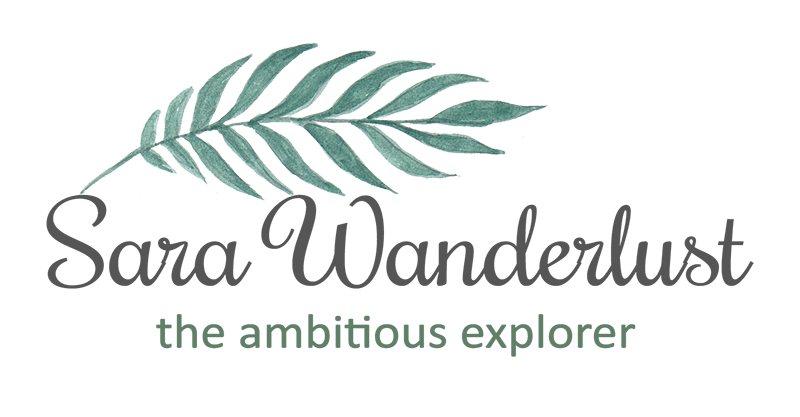 Founded in 2009 and since 2011, it made its international mark in over 100 countries world-wide including India, Thailand, Malaysia and Indonesia. At the launch we had Mr Alex Feng, which mentioned that they focused on their motto to 'Dare to push the limit and continue to bring new surprises' and this has resulted in many industry 'firsts' Since it first launch in 2012, the Vivo X1, followed by the Vivo X3 and not the vivo X5Pro has not only consecutively broke the worlds thinnest smartphone record, but also create the worlds most stunning Hi-Fi sound quality phone. I think the amount of effort was definitely taken into action to produce such an amazing hi-tech smartphone. 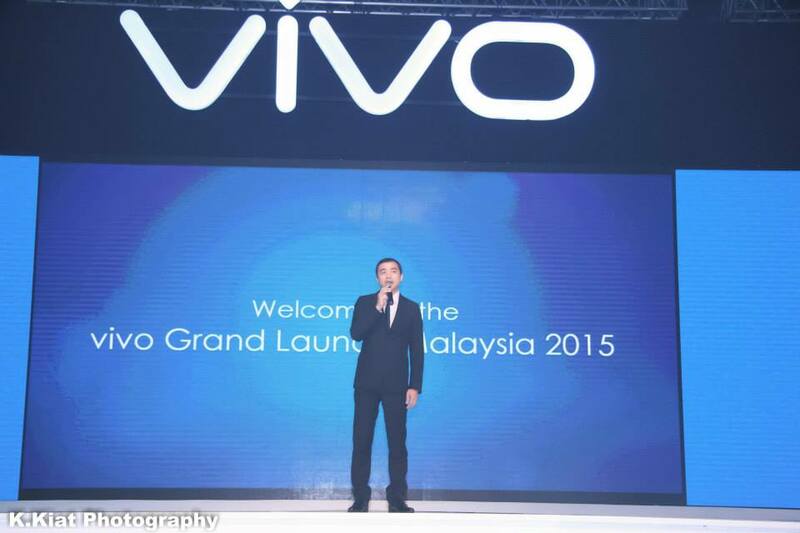 We also has vivo Malaysia's CEO, Mr Lewis Zhang who attempted to speak in Bahasa Malaysia which was an impressive attempt to be a part of the Malaysian market as the brand is committed to their targeted image of fun, vibrant and youthful! Bright lights and sound which got the attendees very excited. The launch was a grand one as spectators, audiences and partners of vivo were there to witness the show of light, colour, sound and amazing performances to celebrate the joyful event. 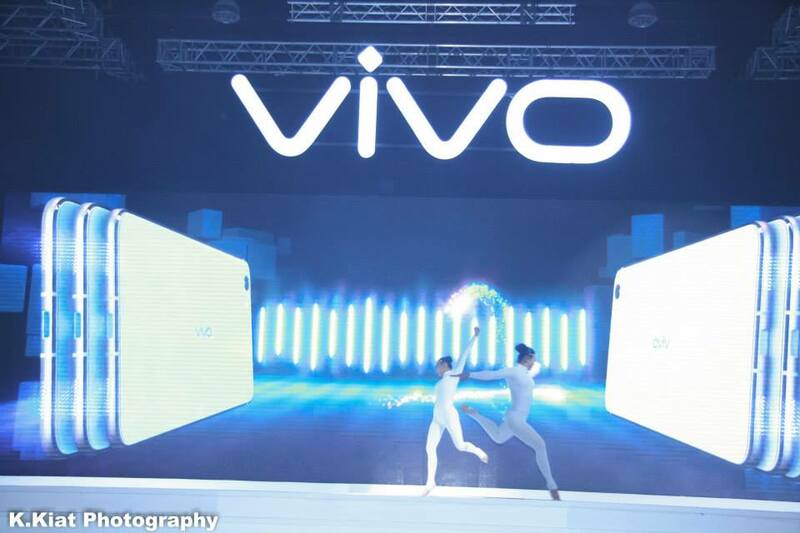 Through some video presentations, the concept was clearly brought out to achieve the design of vivo X5Pro. This gorgeous piece of technology was inspired by nature and the phone features curves in such a way that it resembles a drop of water. Its double sided with 2.5D glass combined with a metallic farm design and breathtaking finish packed in a slim 6.44mm body made it stand out from the rest. 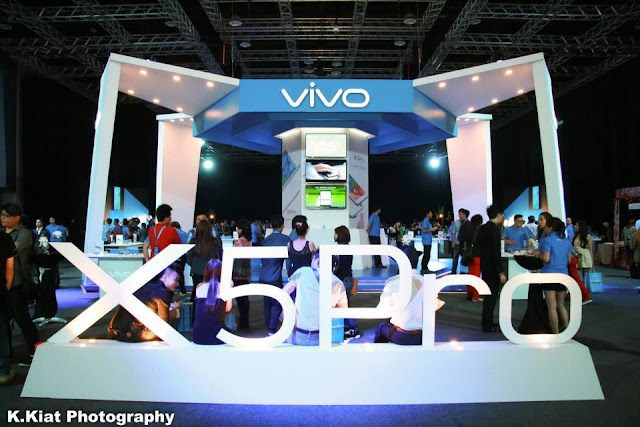 With such concentration on detail, the vivo X5Pro is impressive in both visual and function. 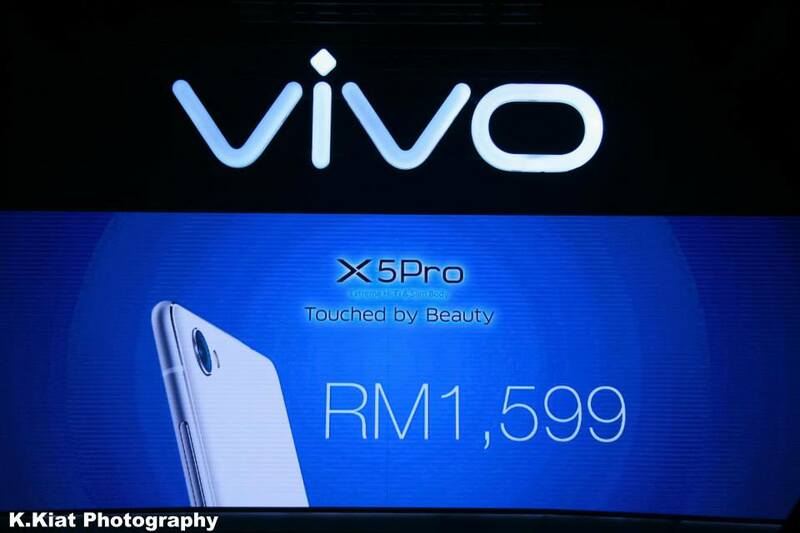 And of course, with such high-tech detail, the price was cheaper than expected, retailing at RM1,599! Thats crazy reasonable for such a smartphone! 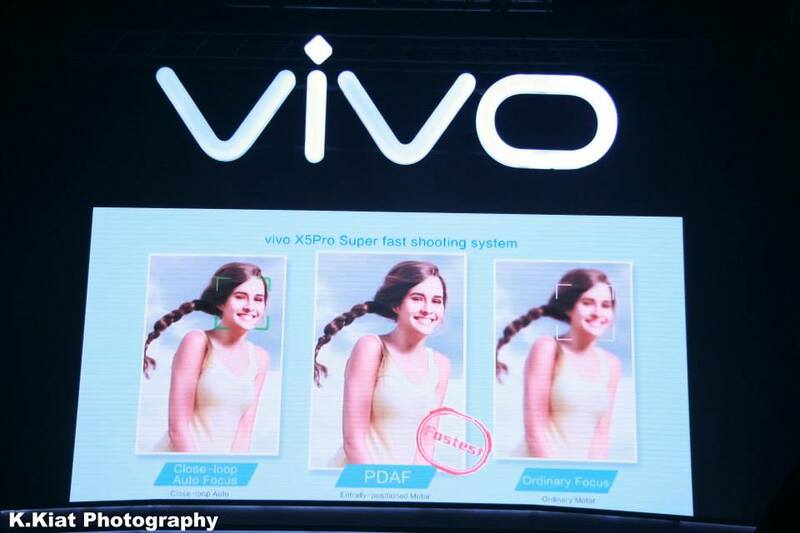 Definitely a competition to the other smartphone brands within the industry. What really caught my attention was the features of the vivo X5Pro which comes with a SmartWake, a fully customisable screen gesture feature, and also the focus and central positioning feature of PDAF, with high speed flash! 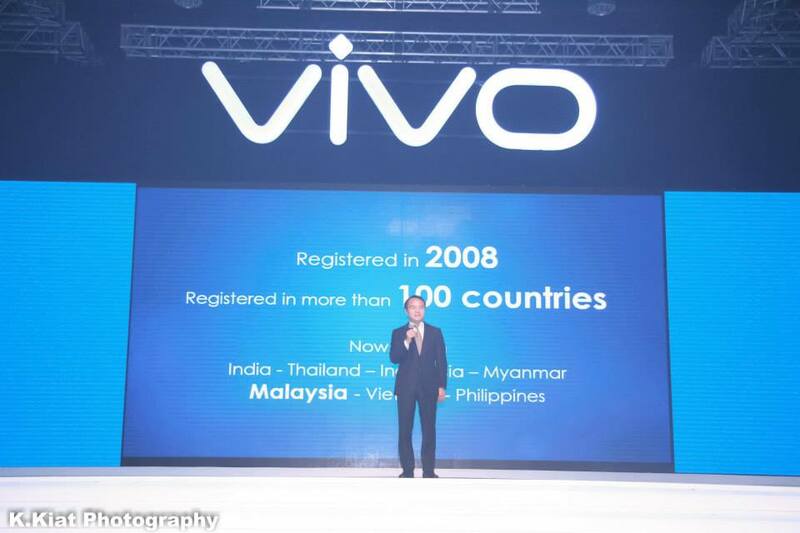 This is an achievement by vivo which managed to create a smartphone with the industry's fastest AF speed. Amazing! Metal Edge with curved glass. But all in all, i think as a youth myself, vivo X5Pro promises modern users that the phone would 'wow' a youth or anyone who is young at heart that they would be satisfied with the latest vivo X5Pro. It runs on the AKM AK4375 chip, with state-of-the-art Hi-Fi sound quality, slim body, high quality camera and also a FunTouch OS feature which still focuses on being a Hi-Fi standard phone. The event ended with some food for those who are fasting which was very nice of them to take consideration to the Muslims who attended, and also who were fasting. Hope you found this read informative. For more information do head over to their Official Website or Official Facebook page for more information. Also not to forget to thank KKiatPhotography for an amazing job on the photos taken at the event. Do check out his Facebook page for more photos on th event. Introducing to you the CLIO Professional's Tinted Tattoo Kill Brow, the latest innovation to get on point eyebrows which looks natural and stays longer! How cool is that? 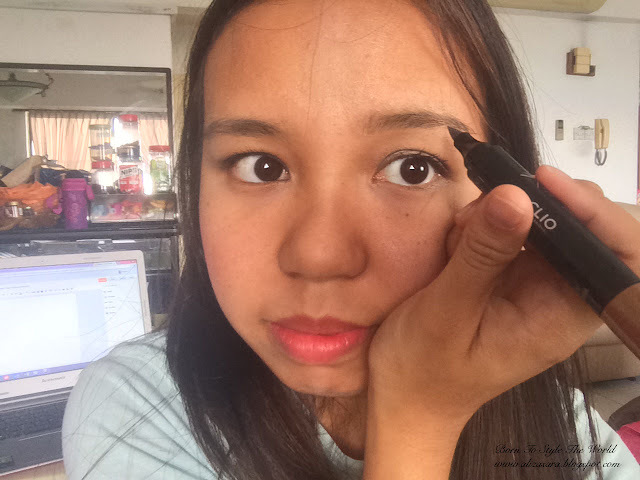 Im sure we all would have those days where we use our 'brow pencil' which we would usually end up having too thick eyebrows or the alignment is just off. 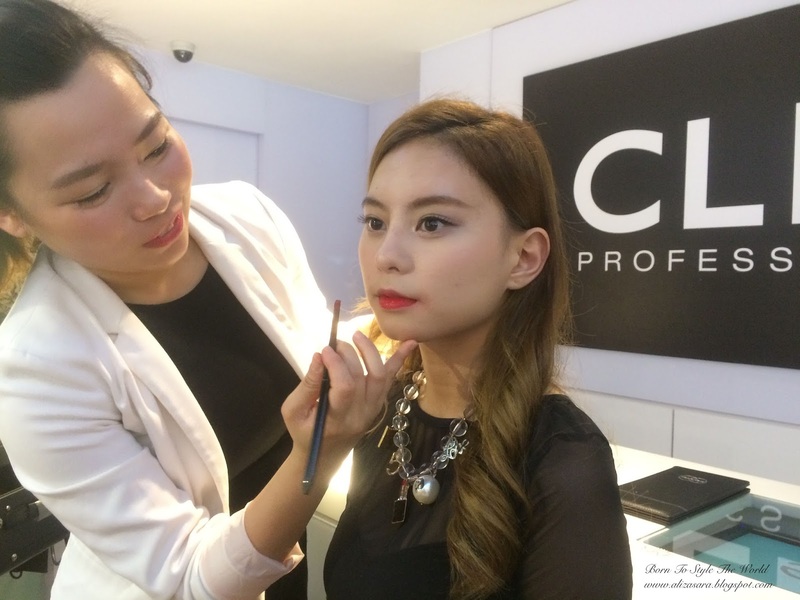 At the launch, we had a professional make-up artist to demonstrate to us on how to get your makeup done with the make-up at Muse by Watsons and i must say, that the whole process was effortless. I managed to take some photos on the process of the make over, and won't you agree with me that the model looks very natural even after the make-up session?! And thats what make up should be doing, to enhance the features on your face, not make you look like you're someone else. 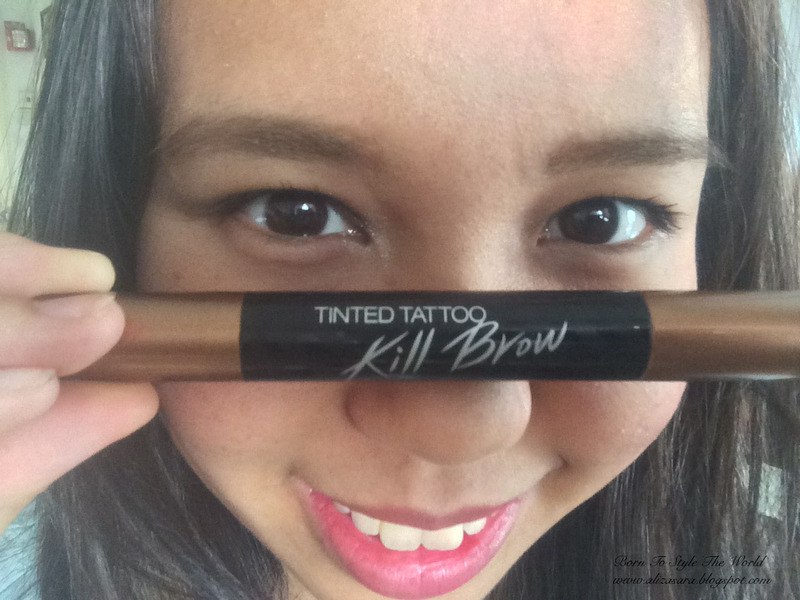 During the demonstration and the tips that was shared at the event, we managed to get a hands-on session with the Tinted Tattoo Kill Brow which amazed me! The reason why behind this invention was because Korean's are always on the go, but they usually groom themselves pretty well, from facials, to skin cares, to make up. 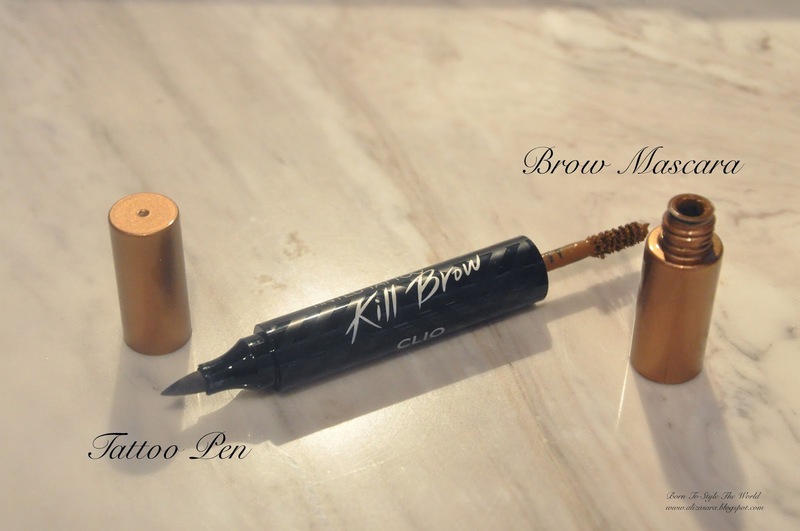 And with all these routines to rush with every morning, the Tinted Tattoo Kill Brow would save you time on getting your brows ready and fresh in less than a minute! You use the Tattoo Pen and draw out your brows. But as mentioned by the friendly staff at Muse Watsons, it would be better if you leave it on overnight and let it dry for eight hours to dry while you sleep. As odd as it sounds, it was recommended to draw them before you head to bed. The purpose of leaving it overnight would be to achieve fuller brows and less artificial looking. 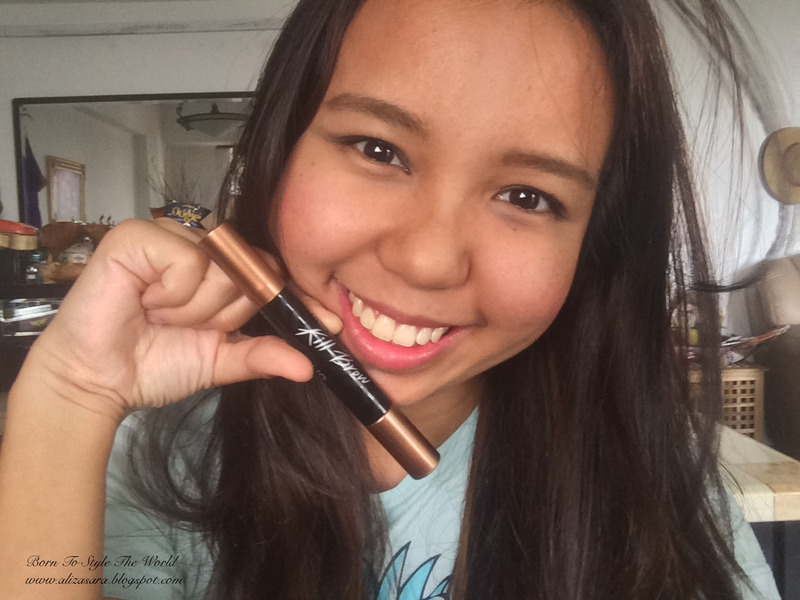 With fuller brows when you wake up in the morning, next would be to apply the brow mascara. And thats it, easy peasy! 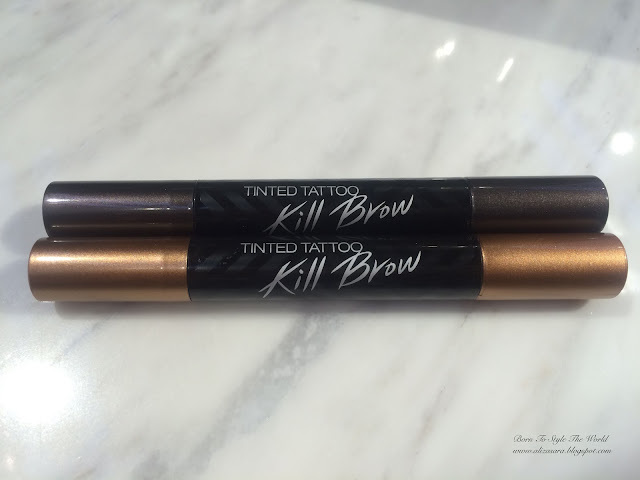 The best part of CLIO Profesional's Tinted Tattoo Kill Brow would be that you have an option to have it thicker or lighter which depends on when you want to draw out your brows with the Tattoo pen. I managed to actually try applying the tattoo pen right before applying the bro mascara and i was pretty impressed with the result. The mascara brow was very easy to be applied and it doesn't clump, which makes you look as natural as you can be. 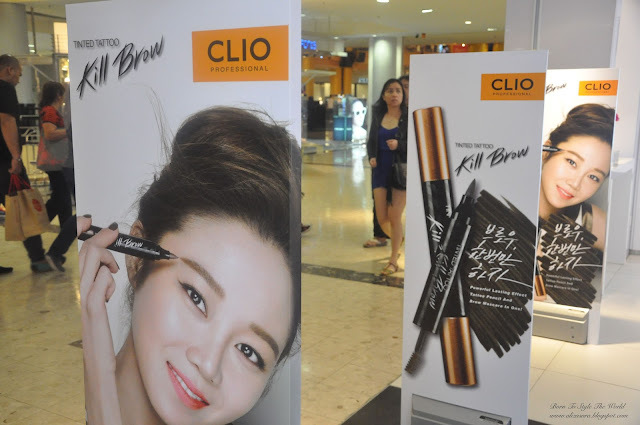 Here are some shots of me trying out the CLIO Profesional's Tinted Tattoo Kill Brow at home. And waalah, no hassle at all! 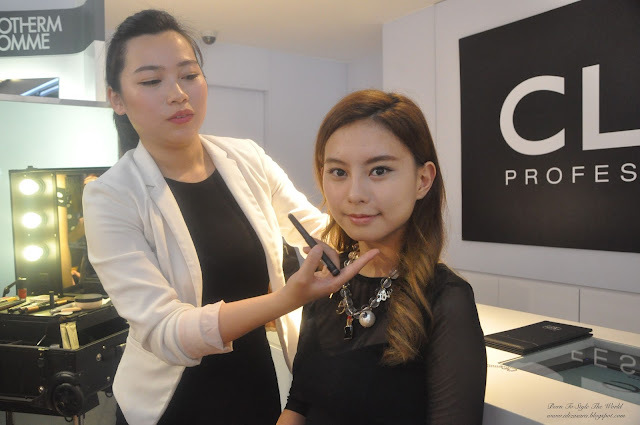 As you can see, with 2 easy steps, it was definitely effortless to get perfect brows. 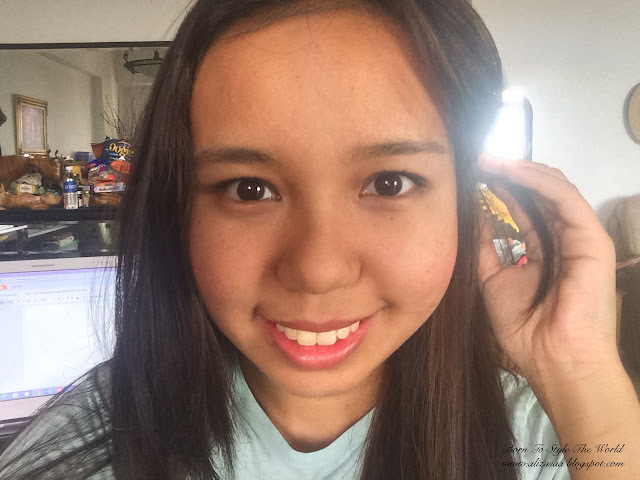 Also not to forget that I'm not good at drawing my brows, this isn't half as bad as i would usually draw them on with a brow pencil. 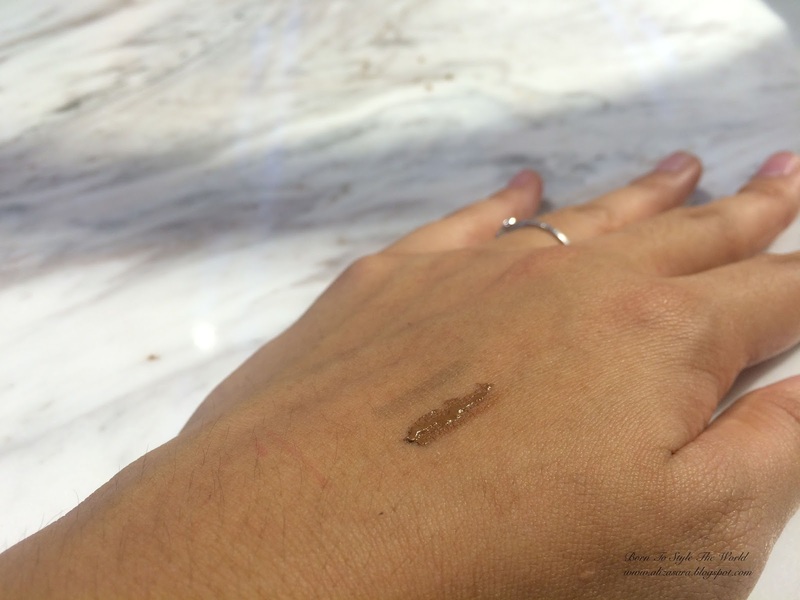 The tattoo pen stays very long and it would stay for around 2 days if you don't remove it with make up remover, so yes, it even stays after showering a few times. Perfect for on point brows when you're going for a swim ;) HAHA. 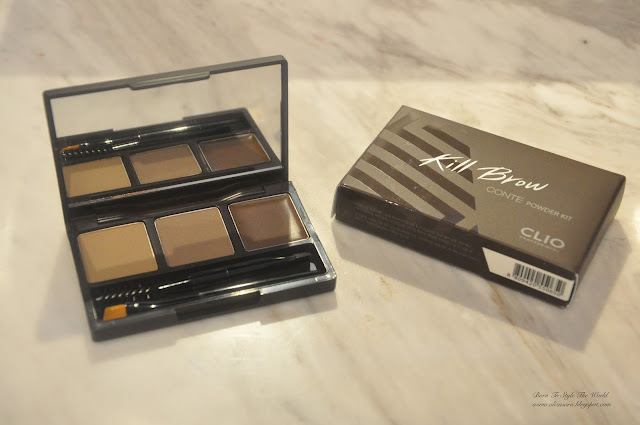 This product comes in three lovely shades which would be Dark Brown, Soft Brown and Earth Brown to suit your hair tone. The one which i was using in my trial at home was in Soft Brown, and it doesn't affect me in any way! 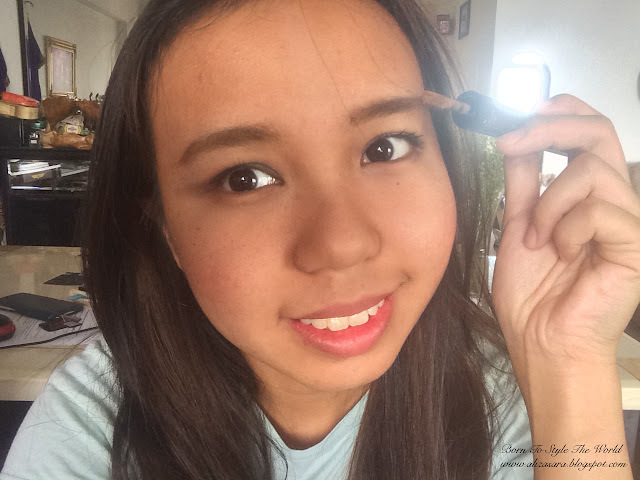 I would suggest that the lighter tones makes you look more natural and if you prefer more defined brows, then go ahead and use the darker tones. Now, as for the price, since its shipped all the way from Korea, its slightly on the high end side. 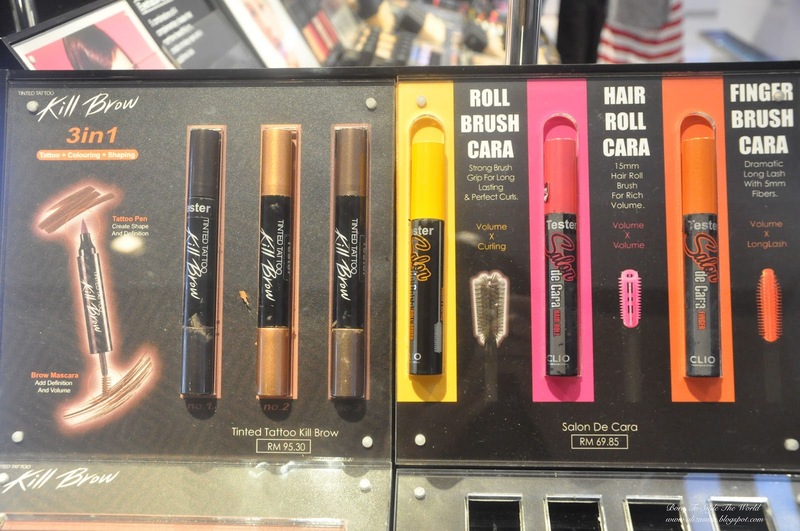 Priced at RM95.30 each, but its of course the latest innovation of drawing your brows. So if you want to keep up to date with the latest trends, or always on a busy schedule, this is definitely recommended as it saves time! 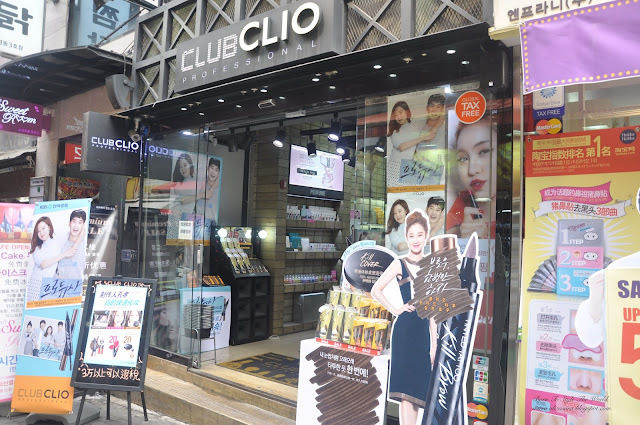 I went to Korea recently and spotted their store at Myeongdong too! Hello CLIO Professional's. 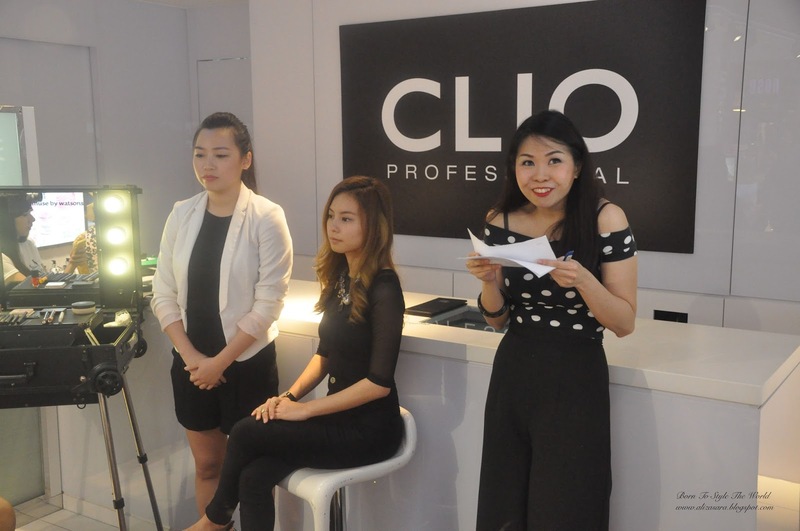 Club CLIO Professional's, at Myeongdong, Korea. So yes, it is a definite Korean brand if you're a fan of Korea. Or if you're planning your trip there, why not drop by the store itself. But fret not, because you can also get it at Muse by Watsons store in Sunway Pyramid for your convenience. 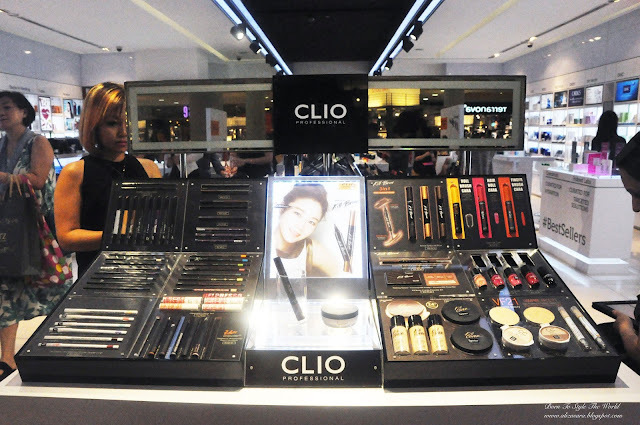 There are other collections from Clio in Muse by Watsons as well, so do make sure you check them out if you happen to be there. Before i end my post, we had a group photo at the launch with the lovely, friendly Muse by Watsons crew, with blogger friends, Mira Cikcit and Anis Farhana. Such an amazing event with such great company. For more information do check out Muse by Watsons to keep yourself updated with the latest cosmetic trends! Hope you found this post interesting and informative. Thanks for dropping by. Mizz Nina has always had her ways to surprise her fans. Since making its runaway debut during the Islamic Fashion Festival at Kuala Lumpur Fashion Week back in June 2014, Madeena has slowly made its mark in the local Muslimah fashion scene and becoming regular at major fashion events not only in Malaysia but recently expanding to our neighbouring country, Singapore for Sheikha Hub and also Brunei, bring you amazing classy designs while embracing the modesty in retrospect of its Mizz Nina's principles. 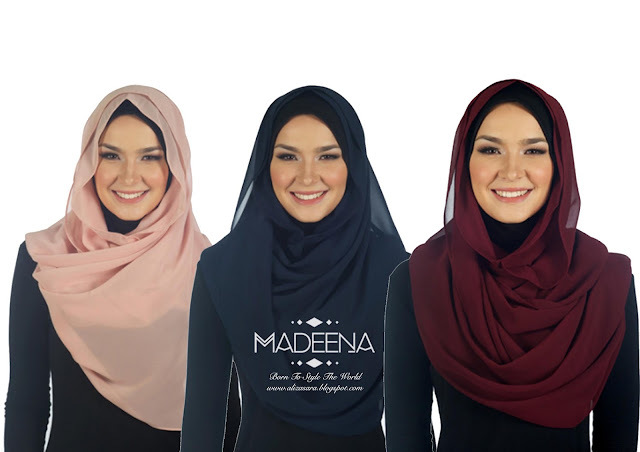 For this year's rays, Madeena brings you its #OwhSoRaya collection to welcome the holy month of Ramadhan that is approaching soon. 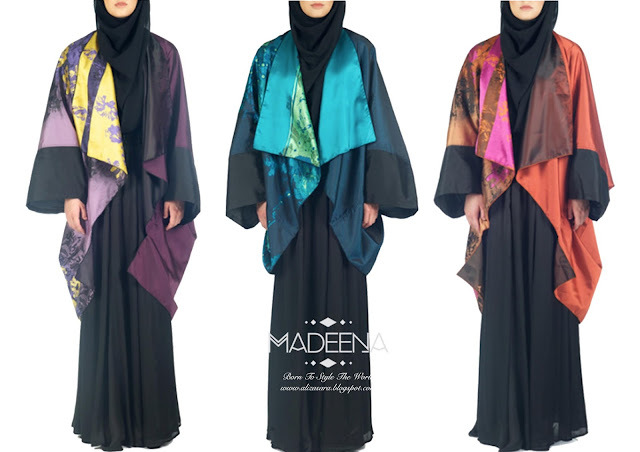 This collection features a series of ready-to-wear pieces that will brighten up your festive season with designs that would suit any muslimah in the world, accompanied by colourful fabrics in her latest collection. 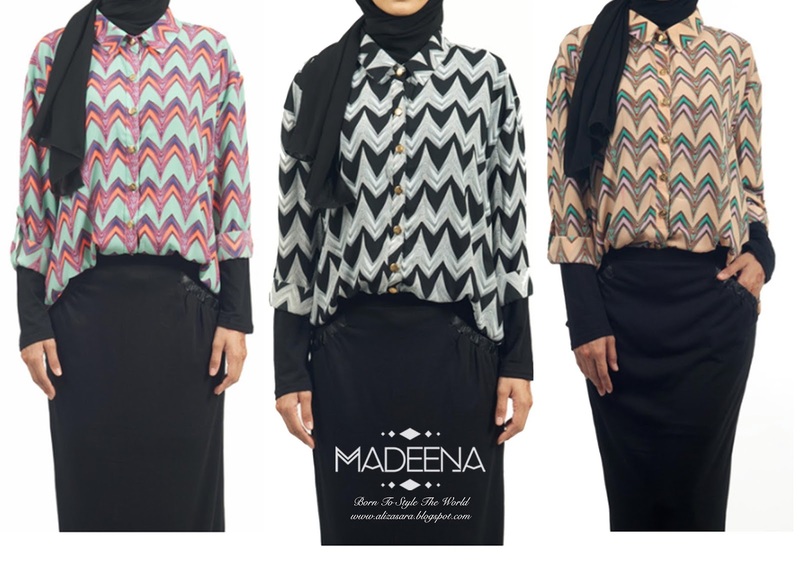 Here are some of the pieces from the latest collection that are currently a must have to muslimah fashion enthusiast. 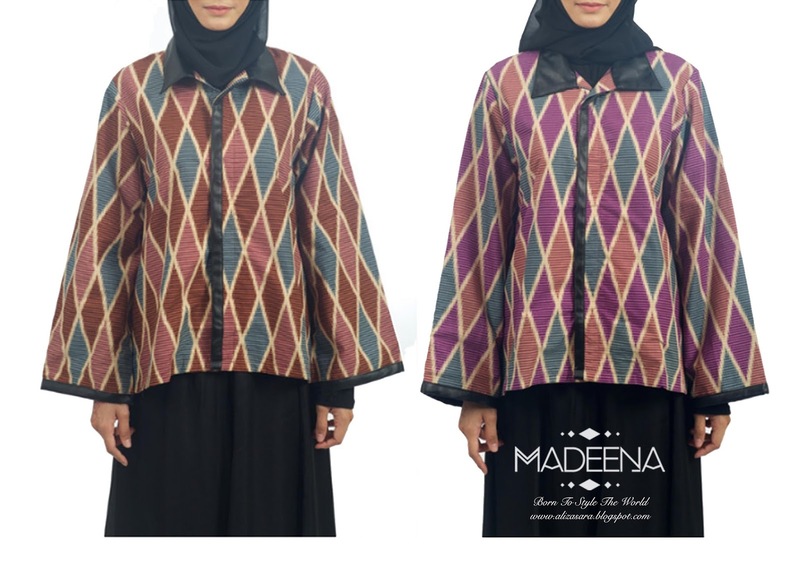 The last time i checked, some pieces has already been sold out! So better hurry if you want to 'bergaya' with Madeena for this years rays celebration. 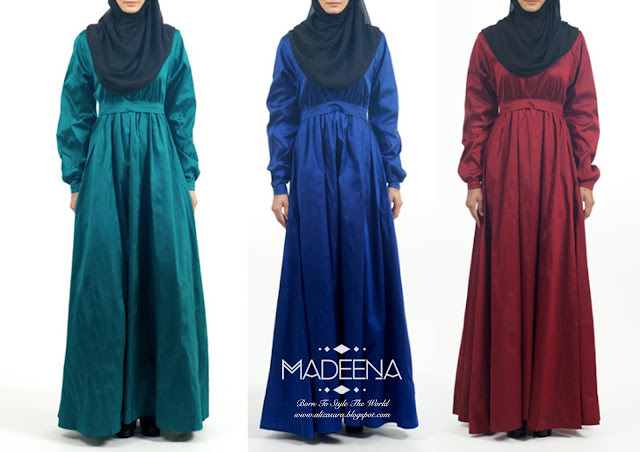 From the #OwhSoRaya collection, we can definitely say that it understand the needs of a busy Muslimah lifestyle that wants a quick fix to not only look good during Eid but also for any occasion. So technically, it's versatile enough to be worn during an occasion or even to your regular lunch out with friends. How awesome is that? 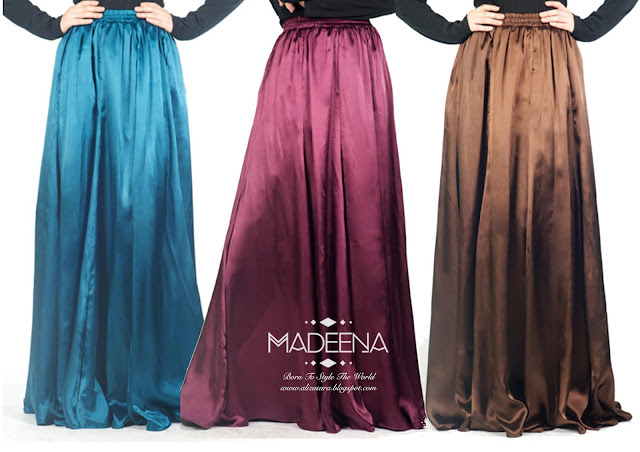 So why not celebrate this festive season in style with Madeena #OwhSoRaya that features a variety of colours and designs for you to choose from. Make a statement and impress your friends and family with the batik cropped jacket wight the satin skirt. 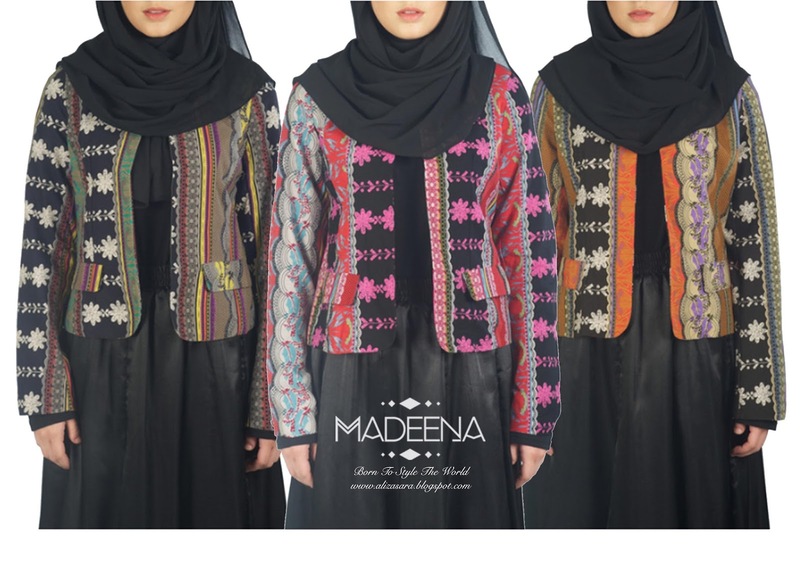 Basically within this collection, you have the freedom to decide what combo you would want to wear for the festive season. Be creative and be bold! 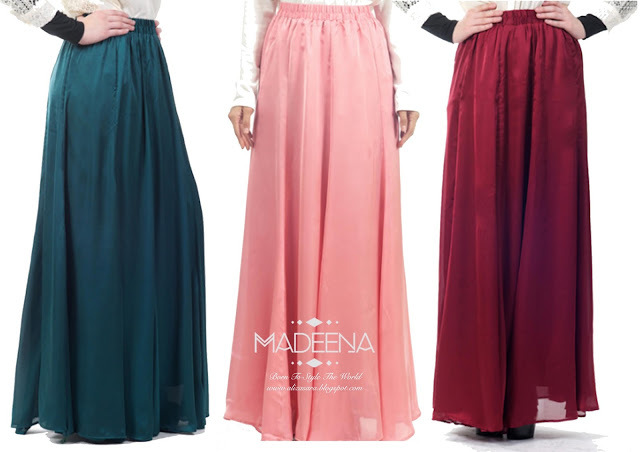 They say beauty lies in the eyes of the beholder, but the beauty of modesty lies in the outfit a person puts on - any Muslimah would feel incomplete if the right attire is not accompanied with a matching hijab. 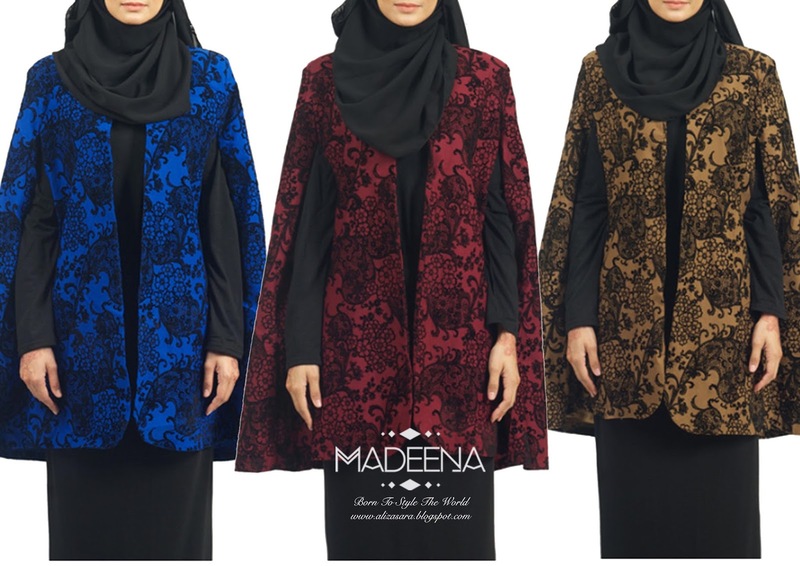 Madeena is a clothing line that offers an array of trendy yet stylish apparels catered exclusively for the modern woman who believes in the beauty of modesty. It apparels are also designed in accordance to match its objective and aspiration to promote decent dressing. Madeena aims to provide a widespread line of modest wear that will appeal not only to the needs of the ever growing Muslimah population, but also to those who simply desires to look good. 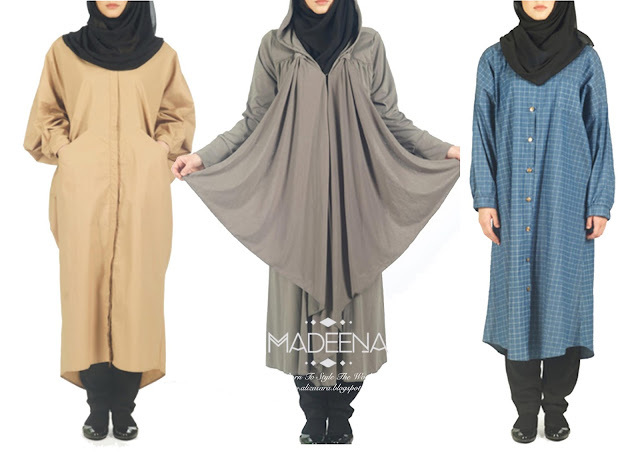 Inspired by Mizz Nina soon after her return from Hajj, an avid fashion lover, she believes covering oneself does not necessarily means boring. "Fashion is fun! Being fashionably modest is the new cool". The brand recognises the desire of the everyday woman who wants to be fashionable while maintaining modesty at the same time, it is a global phenomenon that is slowly gaining recognition. CARRIE ; BAC BUSTER to save the day! A new hero is in town! As guardians and parents, it is necessary that children are well protected from the harmful bacteria. It is a concern especially for children as it could compromise their healthy growth and development. CARRIE has found a way to educate children on good hygiene is the best way to proven the spread of infections and diseases. Teachings and reminding our children the principles of proper hygiene can help keep them strong and healthy away from bacteria. Mr. Marcus as the host of the day. 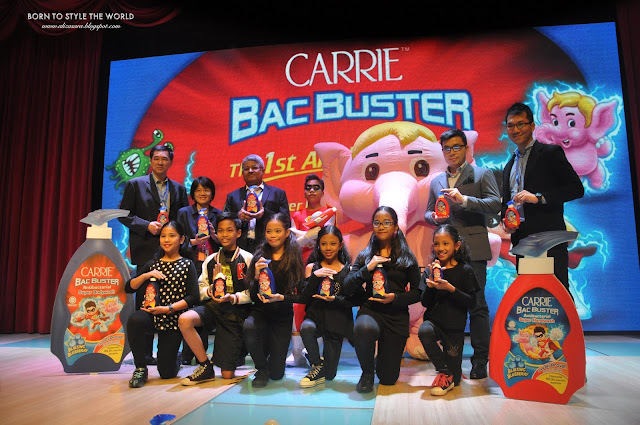 On the 17th of June 2015, Carrie has officially launched its first antibacterial super body wash & antibacterial super hand wash suitable and gentle for kinds aged 7 and above. We had the COO of Wipro Unza Malaysia Sdn Bhd, Mr. Sriram Krishnamurthy at the event, together with the Marketing Manager of Wipro Unza Malaysia Sdn Bhd, Mr. Edward Chen. The host mentioned that educating personal hygiene practice is important for children. Especially when children are going to school, away from parental supervision, they have many activities and interaction with so many people in various environments which my expose them to harmful bacteria that may cause common illness like colds, flu and infections. 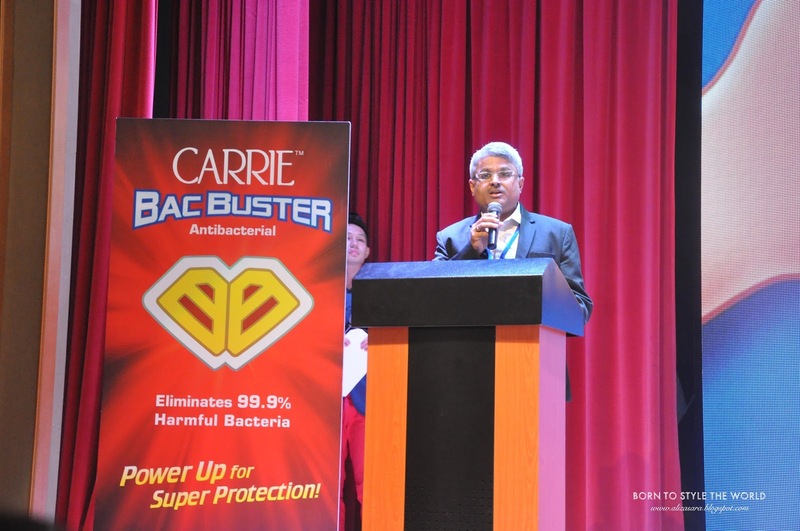 Mr Sriram said" that CARRIE Bac Buster is the first antibacterial range of personal care products specially formulated for children age 7 years onwards. As a brand that cares for the well-bring of children, CARRIE is launching this new range to ensure children stay protected from harmful bacteria and stay healthy." He also said that they are constantly innovating and developing products to suit the relevant needs of parents today, which was the need to ensure their kids are protected from bacteria. Mr Edward Chen, Marketing Manager of Wipro Unza. "Fun for every child is limit to his or her imagination. 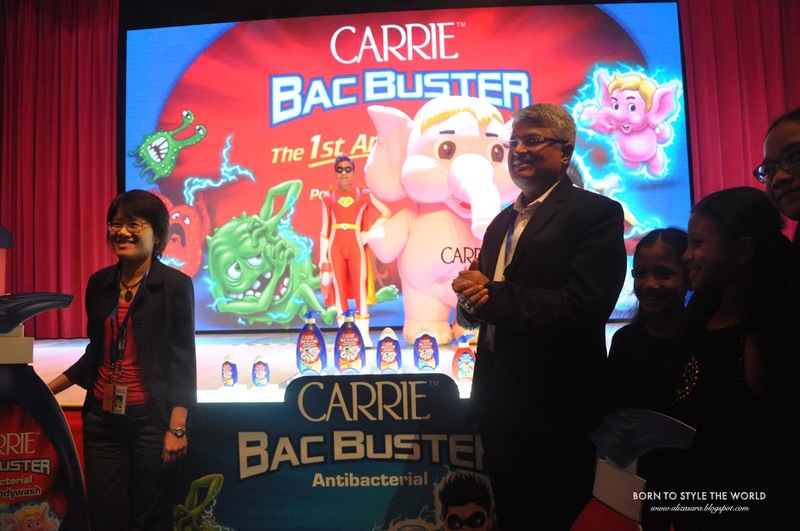 CARRIE Bac Buster educates children on how to combat harmful bacteria by allowing children to stretch their imagination. 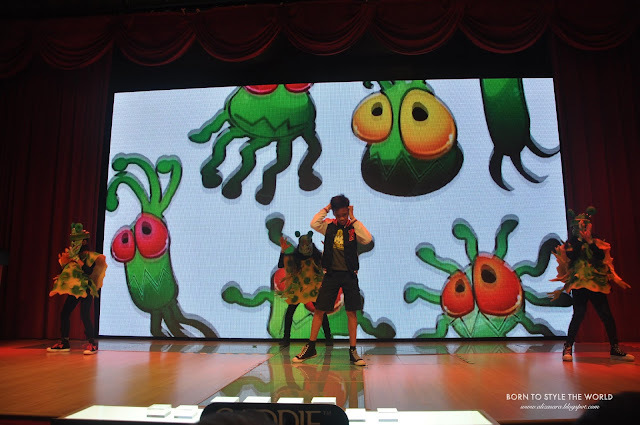 Through imagination, children visualises harmful bacteria as 'evil monsters'. 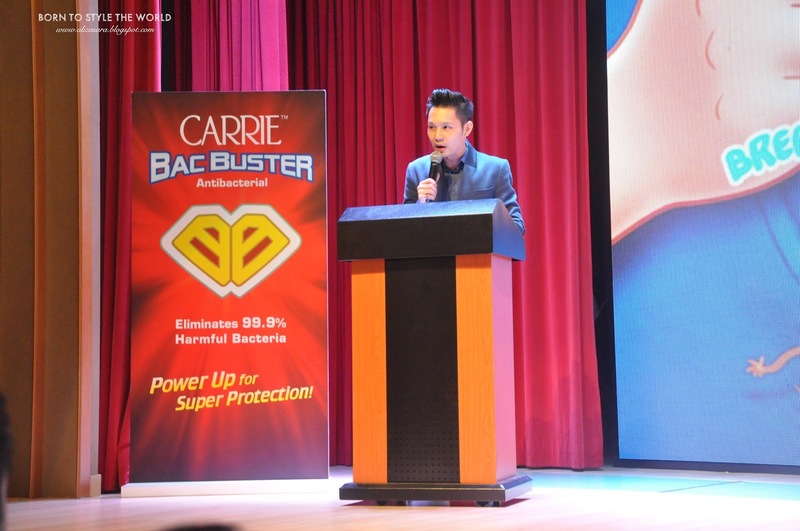 The use of CARRIE Bac Buster empowers them to take on the role as Captain Bac Buster in getting rid of the 'evil monsters' which is the harmful bacteria". 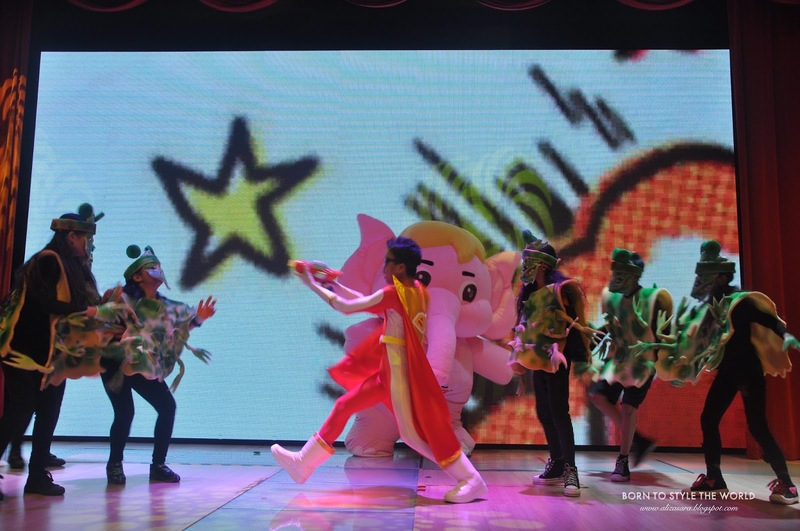 There was also a special presentation by young children demonstrating how Captain Bac Buster protects children from the 'evil monsters' that could be anywhere within the children's environment. 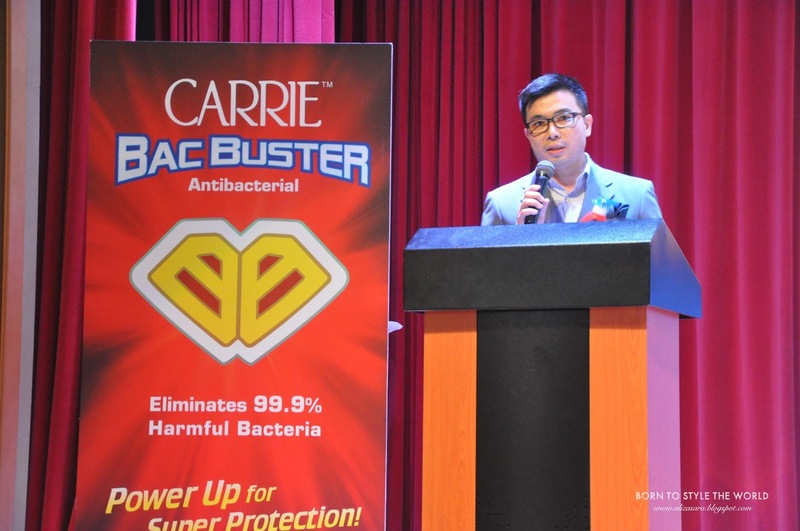 This unique was of communicating the presence of harmful bacteria is depicted in the CARRIE Bac Buster Tv Commercial which was presented at the recent media launch held at KidZania Kuala Lumpur. The event ended with an official launch by Mr Sriram Krishnamurthy placing the last CARRIE Bac Buster at the display area to officially launch the latest range. Mr Sriram Krishnamurthy placing the last bottle to the display to officially launch the range. 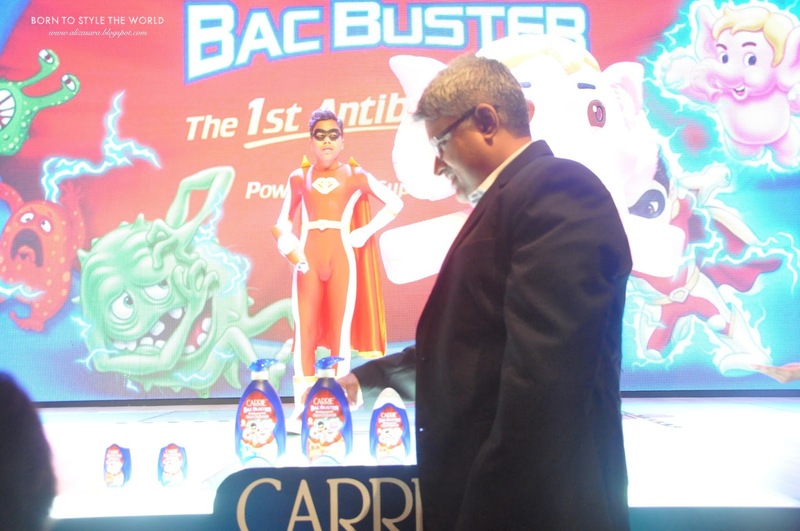 The CARRIE Bac Buster Antibacterial Super Bodywash and Antibacterial Super Handwash range is interestingly packed in bottles which resemble a superhero's spaceship and space gun. 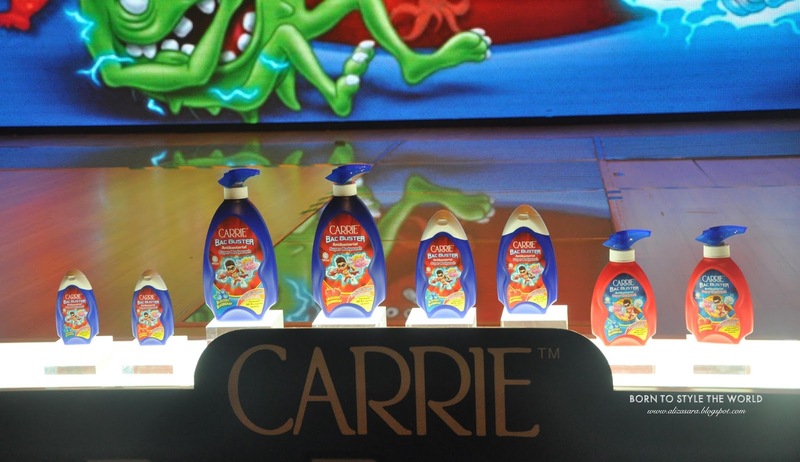 CARRIE Bac Buster is also available in fruity variants of Blasting Blueberry and Smashing Strawberry. 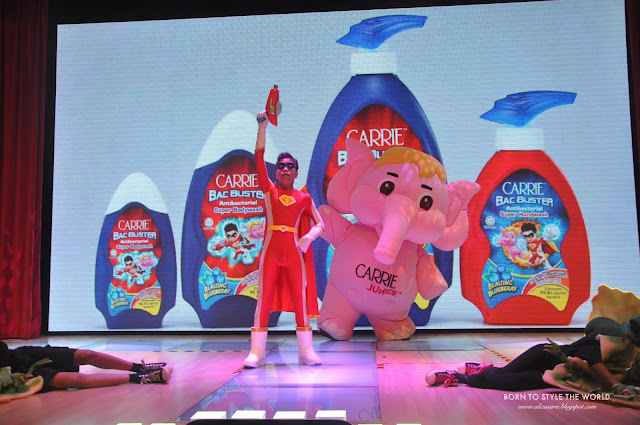 CARRIE Bac Buster in Smashing Strawberry. All prices stated above are included with 6% GST and the range is available at all hypermarkets, supermarkets, leading pharmacy chains and other retail outlets near you. So what are you waiting for? Get one for your kids today! The new CARRIE Bac Buster Antibacterial range specially for children is the first and only 'one of its kind' which every parent should have at home. For more updated by Carrie, do check out their official Facebook page by clicking here. 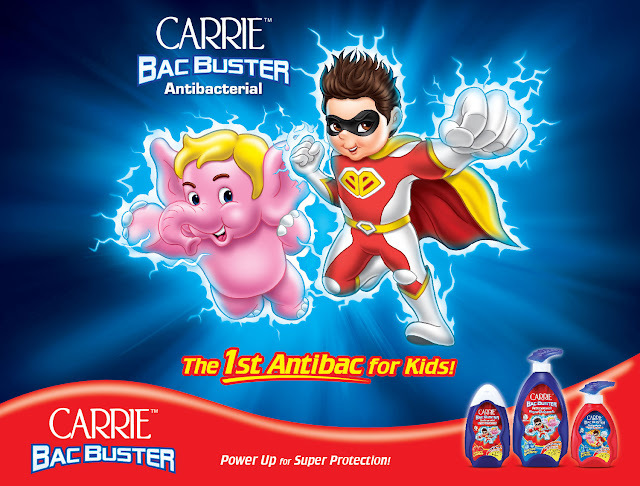 Do ensure that your kids are well protected from bacteria and with the latest CARRIE Bac Buster range, it eliminates 99.9% of harmful bacteria, alcohol free, soap free and paraben free. It is also mentioned that its clinically proven to be safe and gentle on children's skin. 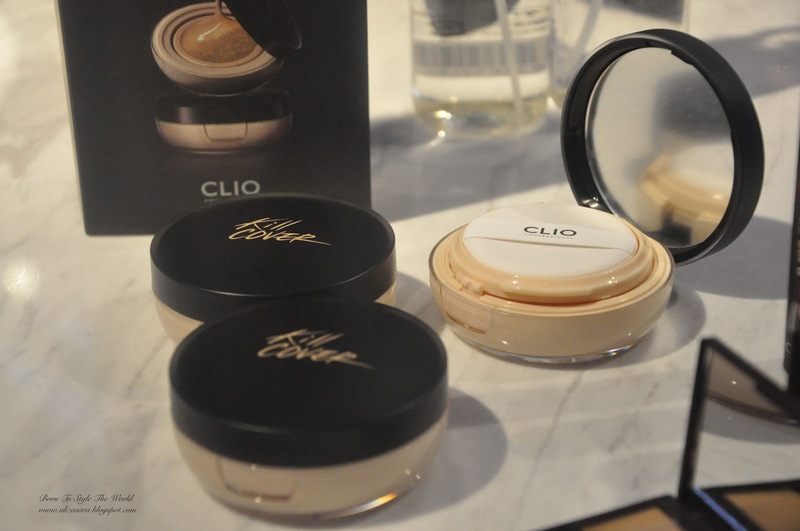 It also contains plant based moisturisers that help maintain skin moisture while ensuring children are protected from harmful bacteria, which would be suitable for everyday use. Hope this post was informative for you and your kids :) Stay protected! You name it, I'm here for it. Feel free to contact me for any inquiries.